Rotisserie cooking is a method in which meat rotates on a spit over low heat so the juice and fat from the meat bastes itself as it cooks, resulting in a juicy, flavorful and tender piece of meat. Rotisserie style cooking uses an indirect heat source so the meat does not cook quickly; this can be done on a gas grill over low burners. 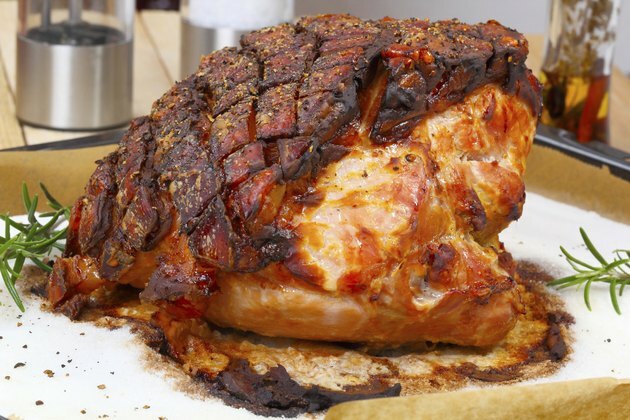 Pork roast benefits from rotisserie style cooking since it is both a fatty and tough piece of meat. The slow cooking breaks down the fat and gristle, leaving the pork tender and moist. Rub the pork roast liberally with your choice of herbs or spices. Truss the roast, if necessary, for skewering it onto the spit. Tie it together tightly with butcher's twine to form a cylindrical shape to ensure it stays together as it turns on the spit. Reduce the heat on the grill to low. Pour 1 inch of water into an aluminum foil drip pan and place the pan onto the bottom grate of the grill directly underneath where the roast will be turning. The pan will catch the drippings from the meat and the steam from the water will further baste the meat as it cooks. Place the pork roast onto the rotisserie spit rod, making sure the prongs of the spit are centered in the meat and the meat is centered on the spit rod. Secure the rotisserie spit onto the grill by following the manufacturer's directions. Turn the rotisserie on, close the lid and cook for 20 minutes per pound of pork, until the internal temperature of the pork reaches 160 degrees F.
Remove the rotisserie spit with pork roast using mitts and let the meat rest for about 10 minutes before cutting. Brine the pork roast to provide moisture throughout the cooking process. Pork roast can be marinated to provide both moisture and added flavor. Put herbs, spices or juice into the drip pan to add flavor while cooking.